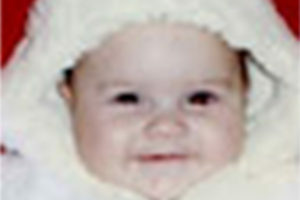 Taylor Jane McMurtrey was born on May 20, 1993. She was a sunny, loving, curious and playful child, who slept and ate well. Taylor loved to go for walks, to be outside playing on the slide or swing. On December 14, 1994, my husband Tom and Taylor picked me up from work. We drove home to get some dinner and I fed Taylor a banana on the way home to tide her over. Around 8 o’clock that night, she began feeling feverish and getting cranky. I gave her Tylenol and stayed with her through the night. She was very uncomfortable that night and I remember thinking I was glad we had an 8 a.m. “Well Child” appointment the next morning. We never made it. Around 5 a.m., I awoke and knew something was wrong-Taylor had dirty diapers, which she never had during the night and she wasn’t complaining about them, either. She was extremely hot and I called the pediatrician, who told us to put her in a tub and if we couldn’t bring the fever down, to take her into the emergency room. I wrapped a blanket around her and we rushed to the hospital, where Taylor was immediately admitted. When the specialist showed up, he confirmed what the emergency doc suspected-bacterial meningitis. They decided to send her to Pediatric ICU at another hospital. When we were finally allowed to see Taylor, she had been pumped full of antibiotics and fluids and her little body had swelled up unbelievably. She was breathing with the help of a respirator. I heard a Code Red announced and instinctively knew that it was Taylor. After what seemed an eternity, two doctors came to tell us that she had died. It was 1:30 p.m. on December 15. She had been ill less than 24 hours.